I had to choose between photography and a hot stone massage this evening and, well… I chose the massage. It was amazing, really worth it. Anyway, I have some shots here, taken in an abandoned unfinished house in Lifou in the South Pacific. This was particularly challenging for today’s brief, because the building isn’t exactly standing up straight to start with. Anyway, I’ve used the levelling tool in Lightroom and done the best I can. 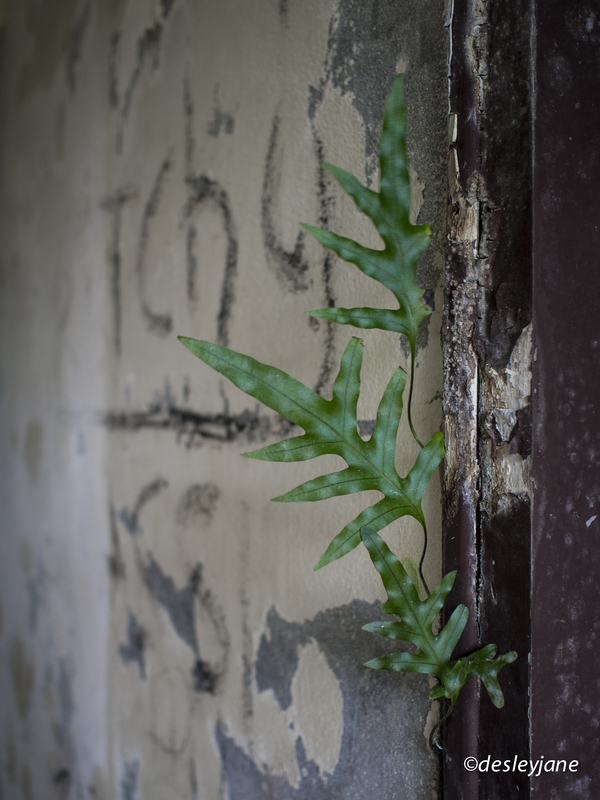 I really love my header image – green life growing out of an old doorframe. I spent ages in this building. There was graffiti on the walls, rubbish everywhere, broken windows, holes in the ceiling, and a stairway to nowhere, but the eerie quality really got to me. I can’t believe there are only two more days to go in photo101 November. I hope there’s something else just around the corner – does anyone know?! Next articlePhotographyPhoto101(19): Double on the Double. I don’t know, but I guess they’ll arrange something (hopefully early) next year. Photo101 has been fun! Well, it’s only a couple left now, so I don’t think it’ll be a problem..
Looks like the place needs a bit of a makeover! Yes, it’s a bit of a fixer-upper! Thank you. There were white walls, cream walls and these turquoise walls – all covered with graffiti of course! Creeeeppy good. Lol. Particularly liked the last one with the branch falling through. Not a fan of going through worn down structures! Hopefully something new starts up soon. Thank you. At least we will be suffering together. I really like the door ways…..leading your eye to God only knows where. Nice job! Thank you. Lush green forest and gorgeous blue ocean just outside those doors! LOL thanks, I feel better. It was amazing! Yes it was really quite eerie but also a nice solitude. There were no other people around for quite a while and there I was, surrounded by the remains of my ancestors. I will have to go back and meet some of the locals next time. Ok so I just realised that you’re on Lifou not on my UK post! Sorry! It was eerie too!! Yes Lifou. Such a strange old house in the middle of nowhere, surrounded by gorgeous ocean views and coral bays and dark forests. Quite creepy.